FBN’s Charles Payne on the success of Donatos Pizza. 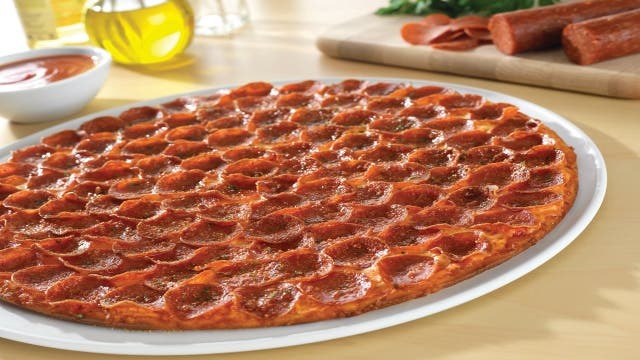 In this Salute to American Success, we’re taking a look at pizza franchise Donatos Pizza. This company, headquartered in Columbus, Ohio began serving customers back in 1963, when then-19-year-old Jim Grote bought an existing pizza shop for $1,300. Since Grote bought the original pizza joint, Pendrey said the company has been operating with the best value in mind. In 1999, the Grote’s received a call from McDonald’s (NYSE:MCD), which at the time was looking to diversify the brand (McDonald’s would also eventually acquire Boston Market and Chipotle (NYSE:CMG) around this time) and was interested in Donatos. The family eventually sold the business to the hamburger chain. When McDonald’s decided to sell the business, the Grote family reacquired it. Today, Donatos has expanded their menu to include salads, wings, strombolis, oven-baked subs and desserts, which are doing well and growing, according to Pendrey. The company also focuses on offering many different types of access points for its customers. “Our restaurants have dine-in areas, party/celebration rooms inside, delivery service… many restaurants have pickup windows and we cater for large parties as well,” Pendrey said. Donatos is taking advantage of advances in technology to help grow their business. The company also relies on data collection to improve its service. Currently, Donatos Pizza has more than 150 locations, 53 of them company-owned. Four new locations are set to open this year, according to Pendrey, who said outlying states are doing very well and the Columbus, Ohio economy is helping improve the core business.